Sketchbook Confidential offers a special glimpse into the sketches of over 40 diverse artists - sketches that were never intended for public display, which makes them all the more intriguing and educational. This 176-page book overflows with inspiration. For each artist, you'll find a 4-page spread featuring several of the artist's sketches, along with insightful text where the artist describes his or her sketching technique and purpose for sketching. One of the main strengths of this book is the variety of artists, media and sketching styles that are represented. Each artist's section feels like a mini-discovery as you ponder their work and process. For some of the artists, you can see examples of finished artwork next to the sketches that inspired them. This, along with the text, helps us understand the leap from sketch to finished work, allowing us to admire the way a rudimentary sketch can unleash the creative flow necessary to bringing a fully realized artwork to life. Artists approach their sketchbooks with different intentions. Often the primary goal is to play, without a 'real' goal in sight. Many of the artists stress the importance of spontaneity when it comes to sketching: being relaxed in the moment, allowing yourself the freedom to be chaotic and imperfect, without worry of the final results. For most artists, this strong feeling of exploration encourages a high level of creativity - a sense of momentum that can be carried on into other more "serious" artwork. Sketching helps artists to sort ideas and impressions by transferring images from the vague reaches of their minds onto paper, wood or any other of the many surfaces that artists use for sketching. Sketching can also help artists deliberately work through a visual problem, such as color or composition. Sketching brings unexpected benefits and new ideas. Many of the artists in Sketchbook Confidential provide tips, explain their approach, and discuss specific materials. One fascinating aspect of this book is noting the many different sketching styles that vary from artist to artist, ranging from messy to neat, and from simple to elaborate - each type of sketch serving a distinct purpose for its creator. Other differences that vary from artist to artist include such factors as: some artist create full color sketches, while some use only a single color. Some sketches look rather "polished" while others appear more scribbly. Some images are sketched on high quality paper, while others are sketched on paper napkins or hotel room notepads. These factors help unleash the reader's own creative impulses, by showing that there are many different ways to sketch, and each way is just as valid and useful as any other. The sketches in this book were created in a variety of media, such as: ink, pencil, oil paint, mechanical pencils, pens, markers, pastels, conte crayon, and charcoal. Likewise, the surfaces that the artists sketch on are just as varied, including: unlined sheets of individual paper, wood, canvas, grid paper, scrap papers, paper bags, journals and sketchbooks. The artists in this book represent a range of backgrounds, including: figurative painters, landscape/plein-air painters, illustrators, sculptors, art teachers and contributors to art magazines, sci-fi and fantasy artists, mixed media artists, graphic designers, animators, muralists and more. Sketchbook Confidential will appeal to anyone who wants to learn how sketching can enrich their creativity, their artwork and their daily lives. It's especially great for beginners who haven't kept a sketchbook before, and might wonder if there is a "correct" way to keep a sketchbook (there isn't - anything goes!). This is the kind of book you pick up and flip through for inspiration, rather than read through in a continuous sitting. Every time you open it up, you're getting a sneak peek into an artist's secret world, one where freedom and creativity are nurtured, mistakes are okay, and anything is possible. Most artists feel self-conscious and uncomfortable when it comes to sharing their sketchbooks with others, so this book can help artists realize that their messy, incomplete sketches play an important role in the artistic process, one that is shared by artists all over the world who explore ideas and doodle playfully in their own sketchbooks. Looking inside someone's sketchbook can feel like an intimate act, and Sketchbook Confidential helps provide readers with a sense of kinship with the artists featured in this book, which is both encouraging and inspiring. The content of this book can appeal to artists of all skill levels, from beginners to professionals, as well as people who are art appreciators but do not consider themselves to be artists. Most of the sketches in this book are based on artists' representations of reality (that is, images sketched from life or from memory of real-life subjects). Although there are a handful of artists in the book who work in an abstract, sci-fi or fantasy style, most of the images veer towards some form of realism. For this reason I feel that this book may mostly appeal to adults or older teens who have an appreciation for representative art, rather than younger readers or those who are only interested in styles such as manga, comic, pop art, Zentangle, etc. Sketchbook Confidential is a great book for teachers to keep on hand as a resource for their students to flip through, so they can see examples of how to use a sketchbook. Readers will learn how artists incorporate sketching into their workflow, and see how it's an important part of the creative process for many artists. As this book is mainly a source of inspiration and insight into other artists' sketches, this is not the right book for people who are seeking specific instructions on keeping a sketchbook, or step-by-step tutorials on sketching. This book is also not the right book for people seeking info on art journaling, which is a whole different art-making genre in itself. As mentioned earlier, most of the sketches in this book are more or less based on the artists' representations of reality (sketching scenes, people or objects from real life) rather than doodles or drawings straight from the artist's imagination. Therefore this book might not appeal to people who prefer non-representational art, such as abstract art, comic art, Pop art, Zentangles, etc. If you make a purchase after clicking the link below, I'll receive a small percentage of the sale, which helps support this site. 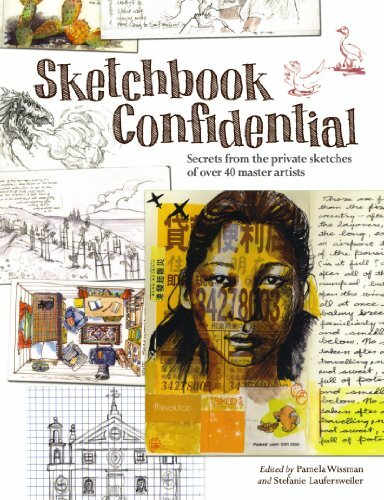 You can find Sketchbook Confidential at Amazon, where it's eligible for Amazon Prime or Free Super Saver Shipping. Click here to see Sketchbook Confidential on Amazon. A complimentary copy of Sketchbook Confidential was provided to me by North Light Books for this review, which is based on my honest assessment of the book. All images in this review are displayed with permission and are copyrighted by their respective owners.